The Kompakt label couldn't be happier to announce the return of this long out-of-print CD collection from Wolfgang Voigt's famed and highly influential Studio 1 series. The Studio 1 CD has been out-of-print since 2000 -- the vinyl versions have remained unavailable since their initial pressings. This CD compiles some of the best of the 12" material (plus 5 unreleased tracks). On the heels of the celebrated Gas boxed set release, Nah Und Fern (KOMP 066CD), this CD is an opportunity to glimpse into a legendary series that is celebrated for being the root and origin of German minimal techno. 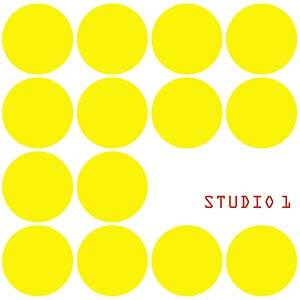 Studio 1 is comprised of edited highlights from the nameless colored Studio 1 12" vinyl series recorded by Wolfgang Voigt in the mid-/late '90s. Cologne artist and Kompakt founder Wolfgang Voigt's (aka Gas, Mike Ink, M:I:5, etc.) most celebrated alias, Studio 1 (pronounced "Studio Eins" and not necessarily a reference to the legendary Jamaican dub productions) is not so much a title but rather a series of ten influential records. Beginning with the Green record in 1995, Voigt began releasing one Studio 1 record after another, with each untitled record bearing only a different color to differentiate it from its predecessor. The records featured a unique style of ultra-minimal techno, characterized by a palette of bouncy beats at varying frequencies, intricately arranged into a spacious yet complex multi-layered rhythm. This palette of bouncy beats owed more to warm dub bass beats than crisp, percussive bass beats, instantly differentiating itself from the traditional sounds of techno. Back by popular demand and more relevant than ever.